«Kyiv in miniature» is a unique museum where you can feel like a famous Gulliver! The park is located in a picturesque place on the bank of Dnipro river and invites you to look at the smallest city in Ukraine. The territory of this mini Kyiv is relatively small, so you will not have time to get tired, and a lot of positive impressions are guaranteed. The exposition of the museum has more than 48 miniatures. This is a huge collection of exciting handmade masterpieces. Here is the main street of the capital - Khreshchatyk, where the traffic, as in life, does not stop for a minute! The Independence Square, decorated with flower beds and fountains, is crowded too. The transport movement on the Moscow Bridge was frozen in traffic jams, just as it happens in real rush-hours. The huge ships drift on the Dnipro, and the Kyivv Pechersk Lavra shines with its golden domes. 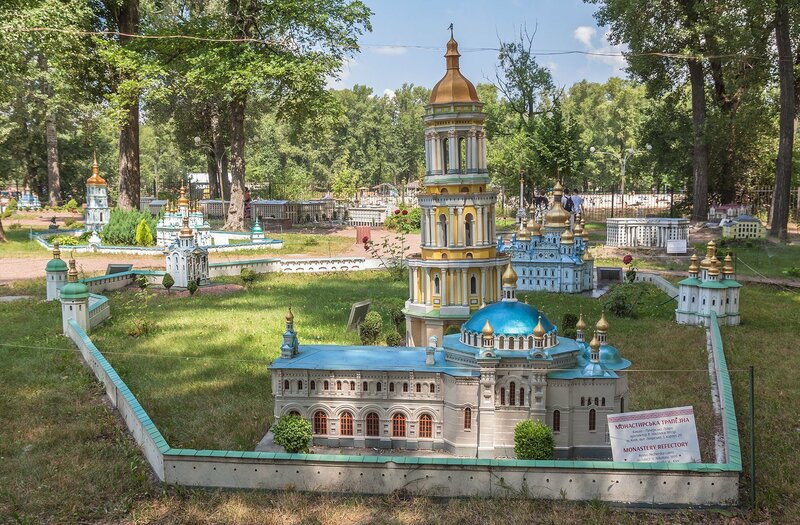 In the parks and squares of mini-city there are monuments of the most famous figures of culture, politics and arts of Ukraine, and at Boryspil airport five planes have just landed from different parts of the world. All these exhibits are exact copies of the large metropolitan originals at a scale of 1:33! At first it seemed that life in "little Kyiv" have stopped. There was no dense traffic, lively streets and fountains ... It could show only the architecture. But recently, the first citizens settled in its walls - they are the security guards, white collars, who rush to their offices, firefighters and teachers. So, for today the mini capital has more than 700 small inhabitants. Little Kyiv is growing as fast as its big brother, real capital. It is developed by 20 specialists who work on the creation of the new models and monitor the state of existing ones. To build the house, even in miniature, takes a lot of time: the building of first 48 exhibits took almost 4 years. Such parks exist in many countries of the world. They are under the patronage of the state and the national pride of the country. If you are bored with a city noise and you have a desire to spend time in the nature, the park "Kyiv in miniature" is a great place to spend your spare time. What a cool creation in a beautiful section of a beautiful city! Surprisingly, this is my first time there. Well, it's good to visit with kids, otherwise, it's fine but only once. I visited in winter, probably spring is lovely, will do it once again in May. For less than 2€ you can see many buildings in miniature. Mostly from Kiev, but also from other places in Ukraine. Pretty cool. Center for the Development and Support of Family Education "NewTone"